Do you suffer from hand cramps when you crochet? Do you prefer a hard plastic handle or a smooth bamboo? Here’s our handy guide to different styles of crochet hook and exercises to support healthy hands! Most of us suffer from hand cramps when we crochet – whether we have been working with an unfamiliar sized hook (10mm after never venturing bigger than 4mm before!) or speeding to finish a project by crocheting ALL night long – but some of us suffer with crochet pain that extends into our wrists, elbows, shoulders and neck, or are the result of existing health conditions such as arthritis, rheumatism or repetitive strain injuries. After years of carpal tunnel pain that affected my hands, wrists and elbows, I finally had surgery on both hands, and although it has worked wonderfully well, I am still affected by the kind of hook that I crochet with – I can’t work with very fine sized hooks unless they have a good sized, flat handle. These days we can find hooks in a wide range of shapes, sizes and materials, enabling us to combat pain without giving up our favourite hobby! I’m a big fan of hooks with handles – in fact they are necessary for me for all of the smaller hook sizes. A flat handle helps to stop hand cramps and pain for me personally, whether it is hard plastic or has a spongey texture. Clover Soft Touch Hooks have a smooth finish with a shaped contour and thumb rest and come in sizes from 2-6mm. I love these hooks, they absolutely glide through stitches and they fit my hand beautifully. They are 13cm from tip to end, and have a tapered point. Addi Swing Hooks have long shaped handles designed to help you swing through your stitches! They are heavier, and more solid than other hooks and this suits some peoples’ hands well. I suspect you will love this hook if you crochet with a knife grip, but you may find this hook is better for simple stitches rather than stitches that require stacking yarn, such as bobbles, because it has a shorter throat. Clover Amour hooks have a slightly softer, spongier handle than the Clover Soft Touch hooks. The handle still has the comfortable thumb flattening, but these hooks are altogether more rounded. The hook is 14cm long, tip to end. Available in a set and separately. KnitPro Waves are favourite hooks with many crocheters, because this solid handle has a slightly soft, spongey texture. It feels comfortable in the hand, and it’s flat – which some people prefer over a more circular handle. 15cm tip to end. It may be, that instead of a handle, what might make the difference to you is the material of the hook. Wooden and bamboo hooks are warm to hold and less likely to slip, so you don’t have to grip quite as hard as you work through stitches. KnitPro Symfonie hooks are a riot of gorgeous colour – and stay warm in your hands without slipping. The slight ‘bite’ of the wood means that slippery yarns don’t slip, and this, in turn enables you to relax your crochet hold which can help with cramp. Pony Bamboo Crochet Hooks go right up to 10mm, and are smooth and soft. The same principle applies here, the bamboo surface stays warm in the hands, and the bamboo stops the yarn from slipping. If you suffer from painful crochet cramps, remember to take regular breaks, and stretch your hands – try our hand stretches to keep those hands flexed and moving! Have you got any tips for hand health and crochet? What kind of hook do you prefer? Spring crochet projects to get your hook into! 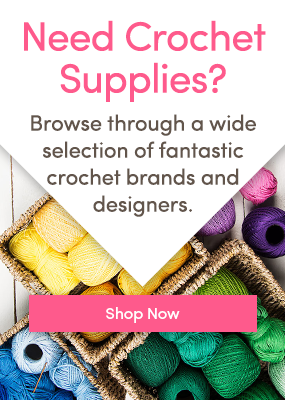 Crochet Therapy for Mental Health Laurel Hill talks comfy crochet with three top tips Where’s my crochet hook? 6 Responses to Which crochet hook is best for hand health? With all due respect, I have to disagree on your statement regarding the Addi Swing hooks. I had read a review and decided to try one. I have a knife grip, and I found this hook to be horribly awkward! It was such a disappointment! However, if you have a pencil grip, it would probably work beautifully for you. The curve lays perfectly between my thumb and forefinger on my hand. But with my knife grip, the curve didn’t fit my hand and I felt like I was just bumbling with it. I found using special crafters gloves help with keeping hands comfortable. They keep your hands warm and help reduce swelling. I too learned to crochet when young and use the old fashioned metal hooks. I’ve tried the bamboo hooks but find the hook too sharp and it splits the yarn. As a rule I only use wool or a wool blend as it is has a stretch which means that I don’t need to have a tight tension. I find that cotton makes my hands ache because of the need to keep the tension tighter. I prefer the bamboo hooks because my stitches come out much loser than when I use metal or plastic hooks. Do you have any suggestion on where I can purchase bamboo hooks that are half or quarter size hook( 5.5mm or 5.25 mm etc)? Any tips for stopping the size markings from wearing off on the wood hooks? I love them but find the size disappears quickly!